Dr. Williamson was born in Iowa and spent her childhood living in various places in Eastern Iowa before her family settled in Cedar Falls when she was in eighth grade. As a junior in high school, she began pursuing her interests in veterinary medicine by working as a “kennel kid” for a local veterinary office. She continued doing this job through undergraduate studies at Luther College in Decorah, IA and Simpson College in Indianola, IA. She attended Iowa State University College of Veterinary Medicine and graduated with her Doctor of Veterinary Medicine in 1994. Upon graduation, Dr. Williamson moved to Chicago and practiced there for a year before spending a year practicing in Ottumwa, IA. 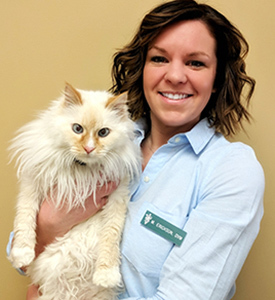 She moved to the Twin Cities in 1996, working for a few different practices before making the leap from associate to owner by purchasing Oakwood Pet Clinic in 2005. It was a good way to occupy her time while she was waiting to travel to China to adopt her daughter. It has also been a great community in which to practice and get to know wonderful people and their pets! Although practicing medicine and managing the clinic take a lot of her time, in her down time Dr. Williamson enjoys spending time with her husband, Scott, daughter, Sara, and their three kitties, Angelo, Button and Captain. She also enjoys cooking and nutrition, reading and gardening. She has a book club that has met together for about 20 years. 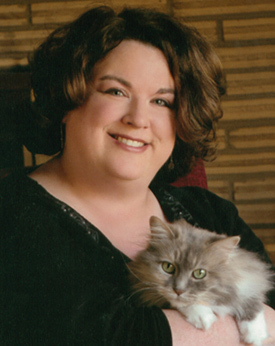 Professionally she is a member of the American Veterinary Medical Association, Minnesota Veterinary Medical Association, OTS Veterinary Fraternity and is on the Board of Directors for the Veterinary Hospital Association. In the past she has also served as a veterinary member of the Advisory Council for the Minnesota School of Business Veterinary Technician Program. Dr. Erickson is originally from Syracuse, New York and moved to the Twin Cities about 2 years ago. She graduated from Ross University School of Veterinary Medicine; with previous undergraduate degrees in Biology and Business Administration. During her time at Ross University, she performed ambulatory care which involved providing veterinary care and education to local farms and participated in V.I.D.A. (Volunteers for Intercultural and Definitive Adventures) which allows students to work side by side with Kittitian veterinarians to gain a perspective of the obstacles facing local clients and their animals. Her personal interests include Public Health and Preventative Medicine. In her spare time, she enjoys hiking, biking and spending time with her cat Mina. Dr. Erickson is also a member of AVMA and MVMA.